Without water, we wouldn’t have ice. In fact, water covers about ¾ of the planet Earth. It also makes up more than half the weight of our human body and is an essential part of life. So, all living things need water to survive. Water can be found in three forms. Liquids as we see coming from the house faucet and the liquid we see in the ocean, lakes and rivers. Also, water comes in the form of liquid rain. Water takes the form of gas as vapor is released when water is boiled. The third form is solid, when the temperature drops below the freezing point and water changes into ice. We now know that ice is frozen water. When water molecules get super cold, they pact together tightly and when the temperature gets to freezing they form a solid structure. Invite the kids to do some unique painting with ice cubes. Make sure to cover your table area with plastic (such as plastic from trash bags). Give each child a sheet of white paper. Provide the young artists with powdered drink mix (like Kool-Aid) in different flavors (and colors). Sprinkle a small amount of powder onto the paper and invite the children to rub an ice cube like a paintbrush on the powder. It’s best if you wrap part of the ice in a paper towel or the kids wear gloves to protect their fingers. As the ice melts, it turns into water and mixes with the powder to show color. 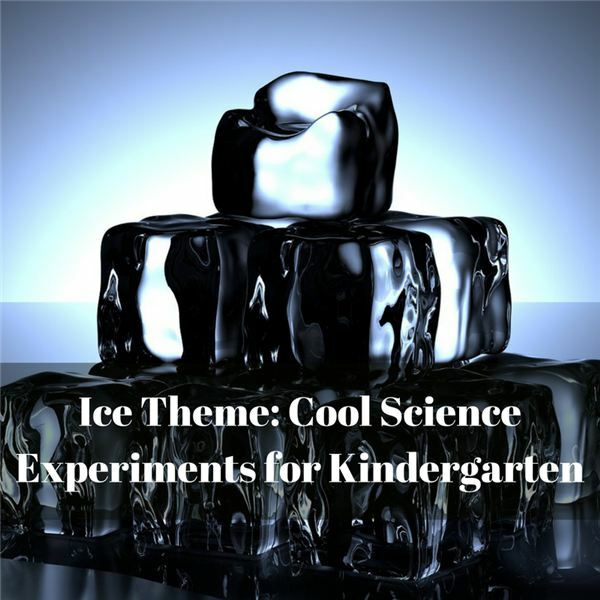 Challenge the children to engage in observations, such as feeling the cold of the ice, the wetness of the melting ice into water, seeing the colors form, and smelling the flavors of the drink mix. Discuss how the ice melted. Is it the heat of the room, the warmth of their hands, or maybe the heat from the pressure applied to holding and pressing the ice on the paper? Note: if you do not have powdered drink mix you can do this same activity with dry, powdered tempera paints. Ice is the solid state of water. Here’s an experiment that will let the kids draw conclusions that ice is frozen water. Gather a variety of vessels in which to make ice. Think about different sized cups, ice cube trays (plain and fancy), square pan, and plastic storage bins (all shapes and sizes). Fill these containers with water, letting the students help you pour water into each. Place these into the freezer until set. When frozen, invite the children to help you release the ice from these vessels. Compare the shape of the ice and the shape of the container. Conclude that ice takes on the shape of the container in which it is formed. Some liquids contract when cool, but water actually expands when it’s below the freezing point. This is the reason you don’t fill an ice cube tray to the very top with water and the reason lakes freeze only on the surface. When water expands and turns to ice, it becomes less dense than the water around it. Did you know this is the reason ice cubes float? Give you students some ice cubes in a glass of water and let them observe these properties. The ice cubes make a crackling sound when they hit the water. The sound comes from the interaction of the warmer water with the ice. The difference in temperature produces stress — and this stress causes small cracks that you hear and sometime see. Do you hear a sizzle sound? These are air bubbles that are frozen into the ice and now escaping as the ice melts. The ice cubes are floating on top of the water. As ice freezes it expands and this makes the ice less dense than water, so the cubes float. Ice cubes tend to flip over as they melt. Since ice melts more on the bottom where it’s exposed to the warmer water, the cubes become top heavy and turn over. Challenge your students to build a tower with ice cubes – one on top of the other build on a paper towel. Can they do it? Most kids will find this task difficult until they learn the magic secret. Salt! Since salt lowers the freezing point of water, the ice melts around the grains of salt causing a pitted surface. Now the uneven, pitted cubes tend to grip each other allowing the tower to be built. So give the kids a small saltshaker when building with ice cubes. Discuss why salt is put on icy sidewalks. The same concept allowing the slick ice to form pits so a person can grip and walk on the surface. Conclude your week with treating your students to a yummy ice pop. Purchase Popsicles from the store or make your own homemade fruit pops. Store-bought molds are easy or use disposable cups and wooden craft sticks. Remember not to fill the molds more than ¾ full because the mixture will expand as it begins to freeze. Think about using pure fruit juices to make these pops nutritious.